At Envision Doors by Design we allow architects, designers, home builders and homeowners to achieve door distinction in every room they design, build or call home. Every Envision door is designed and custom crafted to your specifications. With quality features and workmanship that is second to none, discriminating people choose Envision Doors by Design. At the heart of every Envision door is a solid wood core we call Envision Core® engineered for stability and strength utilizing directional stability craftsmanship. Or, you can option for Envision Species Core® which is species specific to whatever door veneer you select. For instance, you chose Walnut for the veneer, your core would also be Walnut. 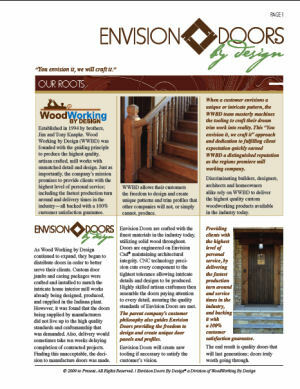 Resulting in a one species solid wood door, but engineered with the stabilizing benefits of Envision Species Core®. If your plans call for a solid wood door throughout we can also accommodate your request. Another key quality build difference within an Envision Door is the use of wooden dowels, these dowels play a vital role in door strength and longevity. Because our doors are component manufactured and hand assembled, dowels are used where ever rail, stile and muntin’s fit together. Bottom rails of every door utilize eight dowels for additional strength, most door designs have a minimum of twenty four dowels, a difference you will feel. Finish veneers are 1/8” thick and are hand selected for each door, to ensure the highest quality finishing veneers in the industry. Thicker veneers ensure the durability, value and life of your door. Hinge stiles are solid wood to the Envision Core® assuring superior screw holding capability for hinging and metal work while also increasing door rigidity. Envision Foam cushions keep panels positioned properly to allow for natural expansion and contraction of wood. These aid in prevention of panel rattle and are spaced 4 inches apart in all panel slots.